Canines are the most wonderfully lovable creatures on the planet. Each is unique in that they have their own personality and expressions. Look into their eyes and see just what they are thinking. Are they planning to get into mischief or do they just want your attention! They can be devils and angels at the same time. My love for dogs lead me to pursue dog obedience training with ABC. Mac's Manners is owned and operated right here in Westerlo, NY. Since my company opened in 2011, I've treated every student like they were a part of my family. Other companies may offer similar services, but my services are top notch, and come with a personal touch. I use positive methods only. Positive Reinforcement means rewarding your dog for a correct behavior. I feel canines learn much faster using fun, upbeat training rather than learning out of fear. 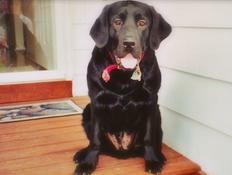 Mac's Manners is a tribute to my first Black Labrador Retriever, named Mac, short for Maximus. He and I bonded the instant we met in September 1999, we were inseparable for nearly 9 years. I miss him, he is now frolicking at the Rainbow Bridge.